If you’re asking the question can seal coating fix my parking lot chances are your parking lot is in need of more than just a seal coating. Seal coating is preventive maintenance. It won’t “fix” anything. This is the biggest misconception that people have. As long as your expectations are realistic with the results you will be happy. Sealer is a water based product that can be compared to paint. It is simply a protective coating. Sealers primary purpose is to protect the asphalt from the sun however, it also protects against water penetration, salt, oil and gas spills. Sealer will fill hairline cracks to prevent water from penetrating. Larger cracks need hot pour crack filler to prevent water penetration. There are many different kinds of crack filler available. The only material we use is hot pour crack filler. This is the same material municipalities use on the streets. Hot pour crack filler doesn’t look that great but it is the only way to fill a crack successfully. If All Star can’t stand behind something they will not use it. Crack filler should last around two years. Getting on a seal coating regiment will extend the life of your parking lot. In general a parking lot should get sealed within 2 years of the parking lot installation. Moving forward a parking lot should be sealed every two to three years. Frequency will depend on how much traffic the parking lot gets and how harsh the winters are. Once on a seal coating regiment, cracks should be filled as they appear. This type of maintenance program will significantly increase the life of your parking lot. At a certain point seal coating won’t make any sense because it won’t be doing anything but making the parking lot black. At this point you will have to start thinking about re-paving. With paving you have a couple of options. In some instances a parking lot can be overlaid. In others the parking lot will be in need of full replacement. 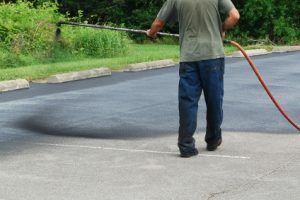 An overlay is when a new layer of asphalt is laid over the existing parking lot. Keyways will need to be cut where necessary to eliminate trip hazards and drainage issues. The parking lot is cleaned and an adhesive is applied. Finally the parking lot is paved with hot mix asphalt. The benefits of an overlay, is that it costs less than a full replacement. The limitations are that the surface to be paved needs to be in pretty decent shape to begin with. There cannot be heaves and a lot of cracking. Heaves and substantial cracking are caused by an unstable base. A full replacement is exactly that. All the asphalt gets removed from the site. The base of the parking lot is re-established by adding base material, fine grading and compacting. Then the parking lot is paved with hot mix asphalt. There is really no downfall to a full replacement but the price. It costs more than an overlay because it’s more work and more materials. If a client is planning on keeping the property more than 5 years this is what we recommend.